The original painting of “American Pride” was inspired by the tragic events of September 11, 2001.
suffered and those whom we have lost. New York City fire fighters. 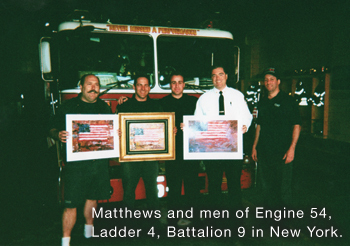 This station lost fifteen men on the morning of September 11. Standing Tall 24" x 36"
Liberty and Justice For All 48" x 48"
Let Freedom Ring 16" x 20"
Colorado Flag Study 12" x 12"
Made in the USA 30" x 40"
The American Dream 30" x 40"
American Color 18" x 24"
Remember Him 24" x 30"
The Heart of Arkansas 24" x 36"
Lone Star Pride 36" x 48"
Keeping America Safe 24" x 24"
Home Sweet Home 20" x 24"
In the Spirit 16" x 20"
American Spirit 36" x 48"
American Spirit 24" x 36"